Synopsis: As we spend around one-third of our lives between the bedsheets, then it’s clear that we need to think carefully about how our sleeping environments cater to our bodies. Anybody who has ever woken up with mysterious aches and pains might want to consider how their mattress might not be offering them enough support. So we are going to take a quick look at what kind of support we should expect from our mattresses, and how we can find a mattress that’s best-suited to our own sleeping needs. It’s easy to confuse a mattress’ firmness and support. But the firmness of a mattress relates to how much sinkage it provides when you lie down on it, whereas the support of a mattress determines how adept the mattress is at helping you keep your spine aligned whilst you sleep. Whilst we may initially think that a firm mattress would give us the greatest amount of support, the reality isn’t quite so simple. This is because all kinds of mattresses have the potential to build up pressure points that put your spine out of alignment. As a result, it’s essential to shop around at retailers who feature a large selection of mattresses so that you can find a mattress that is capable of giving you the perfect amount of support. 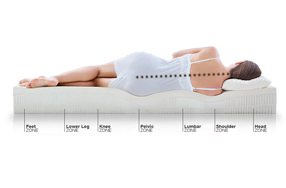 A good mattress should be able to keep your spine perfectly aligned throughout a full night’s sleep. As a result, you will need to look for a mattress that is able to distribute your body’s weight equally across its surface. If you are testing out a mattress and find that the mattress tends to sag in certain areas where your body’s weight is focused, then it’s clear that the mattress might not be providing adequate support. Although soft mattresses may initially seem to be very comfortable, they might not be able to provide enough support to keep your spine aligned. And whilst firm mattresses should be able to keep our bodies well-supported, it’s evident that such an option might not be a good idea if you tend to sleep on your side. This is why it’s always a good idea to check the materials that a mattress is made of. Mattresses that feature pocket springs or memory foam will all lend differing amounts of support, so be sure to see how these materials can help you enjoy a decent night’s sleep. As we all have different body shapes and weights, it’s clear that we will have to put in some research into finding a mattress that delivers the perfect amount of support. Whilst a mattress’ firmness can be determined through how much sinkage it allows, it’s clear that many more factors go into understanding how much support a mattress provides for an individual. So always be sure to try out a range of mattresses before you make this important investment.